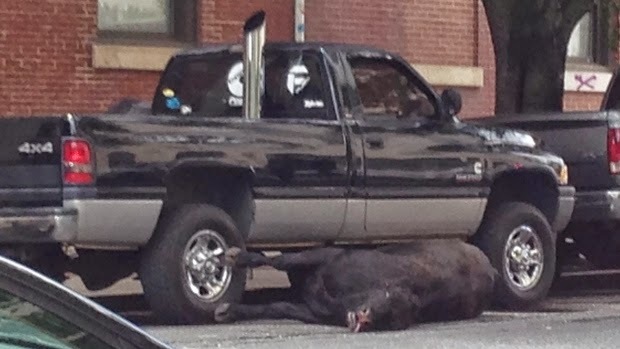 RAISE UR PAW NEWS: POLICE KILLS COW AFTER IT ESCAPES FROM BALTIMORE SLAUGHTERHOUSE. POLICE KILLS COW AFTER IT ESCAPES FROM BALTIMORE SLAUGHTERHOUSE. BALTIMORE --- Once again another innocent life is taken, a life that was merely escaping the imprisonment from a slaughterhouse in the city on a downtown street, Friday morning (Friday the 13th). The innocent cow was shot shorty after 10:15 a.m. in the Mount Vernon neighborhood - authorities believing that the cow had escaped from the slaughterhouse in West Baltimore. Authorities also stated that they received countless phone calls from business owners claiming their concerns about the animal that was running loose. A concern because the neighborhood is home to numerous bars, restaurants & shops. According to an eye witness, who was walking to see a friend when he saw the animal running down the street, stated that he tried to get people out of the way and then heard four shots but didn't see the animal fall. After the shooting, Police then moved their cars to block the view where the animal laid, it's legs outstretched. WHAT IS YOUR OPINION ON THIS STORY?